Do you know that it is your RIGHT and your RESPONSIBILITY as a True Believer to learn and understand the Language of The Noble Quran? Do you know that there's a SIMPLE, EASY and FUN way to LEARN the LANGUAGE of THE QURAN? Well the time has come for you to experience it and share the experience with you family, friends and colleagues! Because the feeling is simply great to understand the Quran! 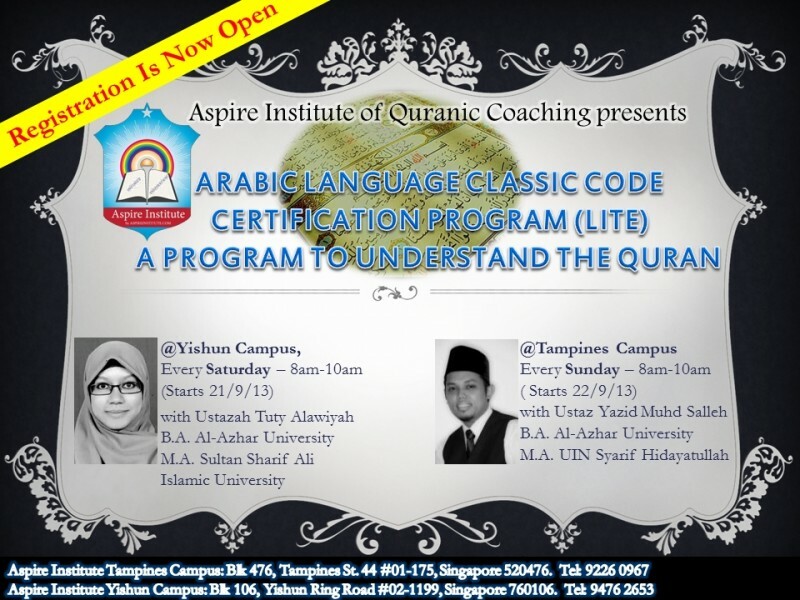 the only Arabic Language developed by Singaporean Quran Enthusiast for Singaporean Quran Enthusiasts. If you're really serious in learning the language of the Quran you will leave your first lesson speaking in Arabic!Even though once a week, if you have that burning desire, you will start understanding the language of the Quran by your second year! A Once Weekly Program of Arabic Language. By the end of the program participants will be able to understand the language of the Quran and able to acquire Infinite Inspirations and Motivations to lead a life of true success and fulfillment in this life and here after. Please send an sms to 9777 9586 / 9476 2653 for Tampines and Yishun Campus respectively, immediately after the transfer.